Before the election, I had to have it out with the League of Women Voters, with their meddling ways. They were trying to register people to vote, kind of bizarre these days. The trend's going the other way! But you know me, I'm willing to live and let live as long as they leave me out of it. I was brought up to mind my own business and look the other way, whatever offensive thing I might see, but once they involve me, then of course it's my business. They wanted to know if I was registered to vote! Me, who used to vote all the time ... back in the dark days when such a thing was considered cool. Now, as everyone knows, it's out; how much nicer it is to let others worry about all that. Three of them took me on. I felt that red hot surge of rage take hold of me, kind of like the unpleasantness a kid feels when he tastes vegetables for the first time. I looked them up and down, appraising them with meanness in my expression, and took their full measure. "What is this?" I asked myself, looking at a table stacked with forms and three women meddling in people's civic affairs. Naturally I wanted to tell them off, even to the point of dressing them down like wild game, but I held back. Instead, I thought, I must educate them and perhaps save three souls from the fires of civic judgment. "You're bucking the trend on voting," I said. Wow, speaking of rage! They took it out on me! They shot back at me the same mean glare, like they wanted to fight it out, but I stood my ground. I told them their old quaint ways are dying. Again, I saw their anger intensifying. Had we put it to a vote, I would've lost 3 to 1. But they couldn't gainsay my basic point about voting. Not voting frees us up for the more important, funner things in life, like ... whatever you want. Is there really any value in one vote? Probably, if you had a million votes for a certain candidate, it'd make a difference. But how do you get a million? It's tough. There used to be the idea that we'd have election day be a national holiday, but it never gained much traction. Now, however, thanks to the trend away from voting, we may just get it. Yea! A national holiday on voting day! A great day to skip out, load up the station wagon and head for the beach! Or somewhere else more weather-appropriate. When you think of the time it takes to get voter ID, finding hard to find polling places, then standing in a line of a hundred to get in, and every other inconvenience, we're saving a ton of time. We always get the best people in office anyway, meaning we're already set to live happily every after. So the League of Women Voters needs to get with the program. And call themselves the League of Women Non-Voters, then put out literature on some good family fun destinations for the day off, and we'll support them in their efforts. They've got my vote! Note: A few people asked how Truth Dillingham did this year in the sheriff race. What? You didn't get the news? Of course he won, 98.6%, about normal. 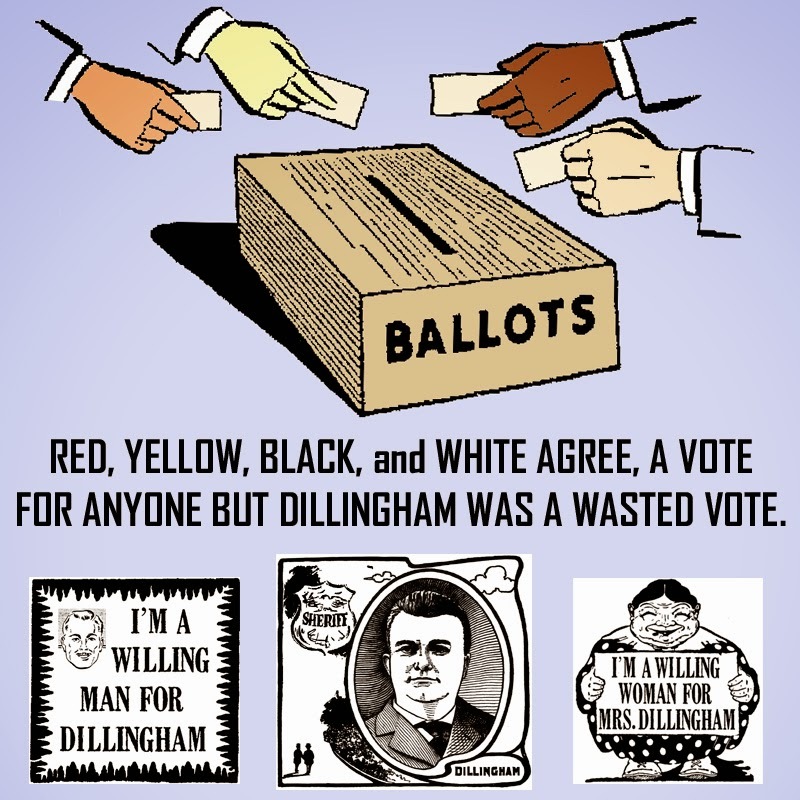 In the key demographics -- Red and Yellow, Black and White -- Dillingham came in first. The only people nasty enough to vote for the other guy were criminals and the other guy's family.